Near the end of January, Swami Amritaswarupananda Puri started an 18 day tour of North India. This was a precursor to Amma’s upcoming North India Yatra. 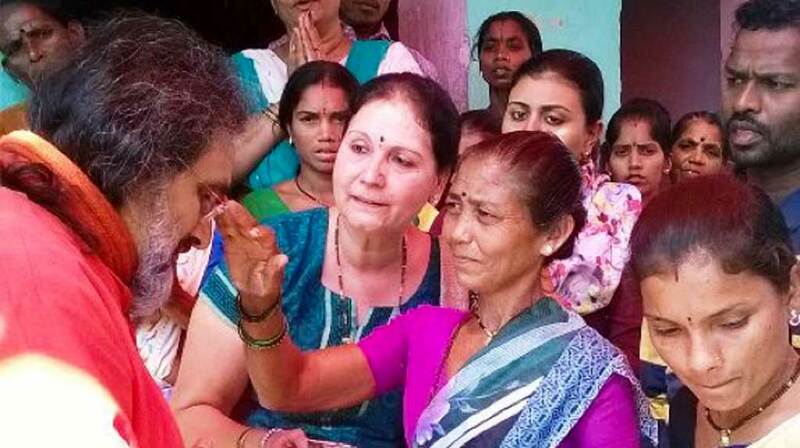 Swamiji made sure that his tour included two Amrita SeRVe villages—Guptapada, Odisha and Ransai, Maharashtra. Swamiji particularly wanted to monitor the progress of the communities and hear from local residents about the work in progress and what else is needed. In each place, he was careful to speak to the villagers in detail as they took turns to explain their problems to him. In Guptapada, Swamiji particularly noted the houses being built for extremely poor families. It was a relief to know that such desperate need is being cared for. In Ransai, the villagers gave a warm welcome to Swamiji and expressed their happiness and gratitude for the new water handpump that was installed. Gone are the days when all the villagers had to depend on one well, a water source which sometimes used to dry up and at other times, became a breeding spot for insects. The third leg of Amma’s Bharat Yatra for 2016 starts from Bangalore on March 14th. Here are the details.